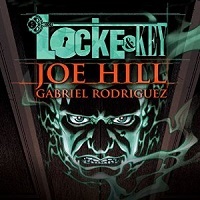 I was thrilled when I heard that the team at AudioComics was adapting Joe Hill (writer) and Gabriel Rodriguez’ (artist) series of Locke and Key graphic novels as audio drama. I’m even happier now that I’ve heard it – this is high quality stuff. I love audio drama! Time to add Locke and Key to the list of reasons why. Locke and Key tells the story of the Locke family, who moved into the family home in Lovecraft, Massachusetts after a tragedy. Teenagers Tyler Locke (played by Brennan Lee Mulligan) and Kinsey Locke (Jaime Alyse Andrews), younger brother Bode (Betsey Kenney), and their troubled mother Nina (Lisa Stathoplos) live in the house, which has a name: Keyhouse. Once there, the young Bode starts to find keys, each one of which has a special magical power. As the story progresses, the Lockes find themselves protecting the keys from the likes of a killer named Sam Lesser (Haley Joel Osment) and the terrifying demon Dodge, chillingly portrayed by Tatiana Maslany and Ian Alan Carlsen. The story is both fascinating and horrifying, combining familiar haunted house elements with the surprising magic of the keys. Friendship, betrayal, good and evil, excellent writing, deep characters… it’s a great story as a graphic novel, and this production successfully captures it, the flawless cast and rich sound adding a new and welcome dimension to the whole. Like I always do with good audio drama, I listened to this with good headphones. There’s a striking depth to the sound in this production. You don’t get the feeling that the actors are standing around in a room reading a script. It’s easy to believe a scene is happening in a cave, or in a house, or outside at night, or wherever. The harder you listen to the background, the more detail you hear. This was achieved by recording the actors on location, as if they were filming a movie. Check out the Featurette at the bottom of the review to see Bill Dufris (director) and Frederick Greenhalgh record groups of actors. The result is so natural. It’s marvelous. Sound effects are used as well, but don’t dominate the production. I particularly liked the sounds used to convey the use of various keys, and the enhancement of actor’s voices, which was genuinely chilling! The score (by Peter Van Riet) is also well done. I found myself looking forward to the theme. I had high hopes for this production and they were all met and often exceeded. I would love to hear more of this kind of thing! In the meantime, I’ll be listening to this one again. Great review, so glad it looks like a good listen! Audible has such great service for their customers, I love their freebies!